You can Design Your Own Log Cabin. This is where you choose from a set pre-defined sizes, roof profiles and door/window combinations but put them together in your own specific design. 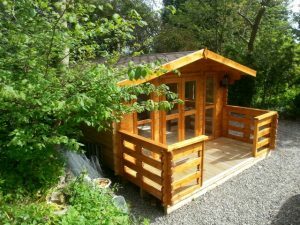 If you are looking for something a little bit different, you can give us the details and we can design and make a bespoke log cabin for you. More information about the different options we offer for buying log cabins on the relevant pages.